Get ready for a spook-fest as only NEO can deliver it - over 90 incredible movies, games, anime and manga ripe for Halloween entertainment in our biggest ever scaretacular feature yet! From festivals of gore to mind-bending mysteries, we've got plenty to keep you occupied this winter! Also, if that wasn't enough, we have some amazing creepy cosplay ideas, and the third season of Attack on Titan to keep you locked in fright! 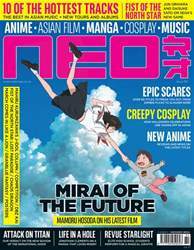 As well as that, we have an interview with the amazing Mamoru Hosoda on Mirai of the Future, his latest film, set to hit cinemas soon. All that, plus previews, reviews, and more - and that's before we've even discussed our incredible flipper feature coverage of Fist of the North Star! 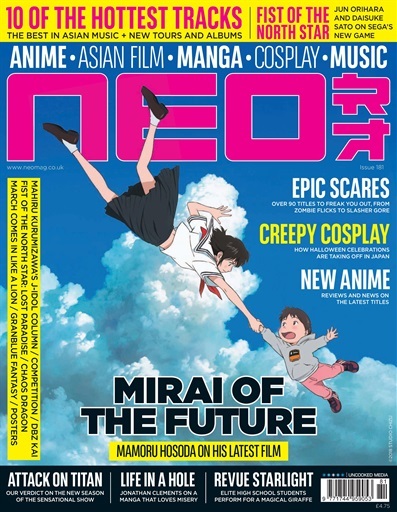 Get ready for some epic Asian entertainment with the latest issue of NEO, out now!